Twelve months after driving up Magnolia Lane “in the horrors” with his putting, the 41-year old Dubliner will once again bid to clinch the elusive third leg of the career grand slam and overcome the putting doubts that have dogged him since he won the US PGA more than four and a half years ago. Committing to his reads on the greens has been a hit and miss exercise for the three-time major winner this year, even with the help of spectacles. But having finishing 10th in his final warm up event behind Martin Laird and Rory McIlroy in San Antonio on Sunday, he will be relying on all his experience on the famed Augusta putting surfaces to put himself in the mix on Sunday night. 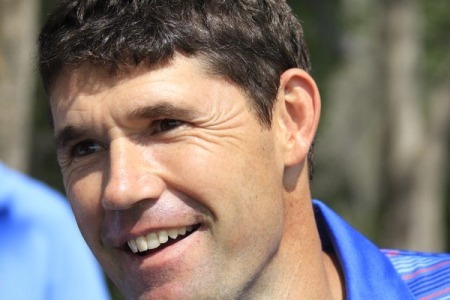 Eighth last year despite holing virtually nothing in an otherwise impressive final round, Harrington’s experience is outweighed by the scar tissue left behind by many Augusta disasters - both his own and those suffered by others. Still, he’s happy to accept those as part of the package having made great strides on the greens since last season. “Putting wise, I was terrible going into the Masters last year,” he reported. “I’m a lot better than that now and have been all year. I was in the horrors going into the Masters last year. “What I was in the horrors with last year was reading the greens and Augusta’s greens are much more about feel than they are about reading it. There’s much more experience and feel on those greens than anything else. “It’s one of the best courses of the year to go to. Once you know it, there’s a lot of experience to putting there. For example, I remember this putt moved this amount or that putt never goes as far as you think it will. “That’s one of the tough things about Augusta for people who haven’t played there. They have to get familiar with putts that always are quicker than they look. While the pines echo with the roars of the great, iconic shots, the ghosts of disasters roam amongst the trees. 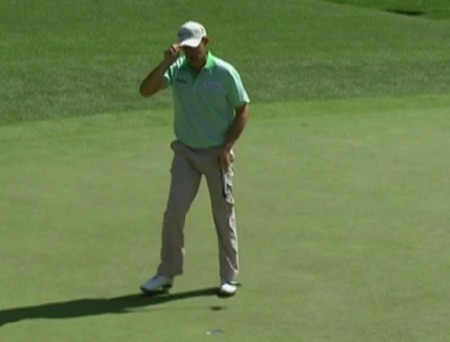 Every aspect of the game is tested at Augusta but none more so than putting. Picture Photo Jenny Matthews/www.golffile.ieHarrington has plenty of his own bad memories but one of his first missions this year will be to head into the bushes right of the 10th hole to see where Bubba Watson was when he hit the wedge that set up a Masters-winning birdie over Louis Oosthuizen in last year’s playoff. 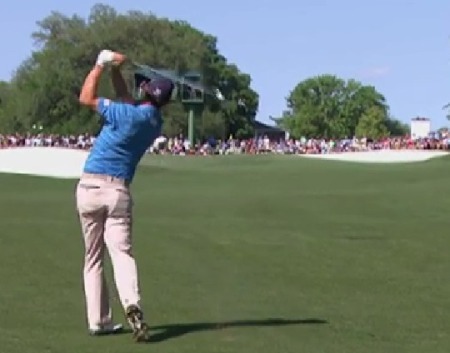 It’s unlikely he will attempt it left-handed but there’s no doubt that Watson’s wonder shot left a lasting impression, like so many immortal Masters moments. Strangely, Harrington is indifferent about Tiger Woods’ chip-in at the 16th in the 2005 Masters - the most recent of his four green jackets - or the daredevil six-iron Phil Mickelson threaded between two trees on the par-five 13th in 2010. There are other shots he thinks are better, or more interesting. “The first year you get there, probably the two shots you try the most are the Larry Mize chip from the right of 11 and the Sandy Lyle bunker shot at 18. “You practice the Seve Ballesteros at 15 (in ’86), unfortunate. You do, that’s the problem with Augusta. He duffed it in the water … you don’t try and duff it but this is the problem with the course, you have baggage. Harrington has had problems on the 15th in the past but while he birdied the hole all four days last year, he’s still not comfortable. Charl Schwartzel made an eagle two on the third to overtake Rory McIlroy in 2011 en route to his green jacket but Harrington is more interested in the South African’s chip-in for birdie at the first in that final round. “I’m just fascinated by the shot,” he said. “A lot of guys would have taken six from there. It possibly won him the tournament. 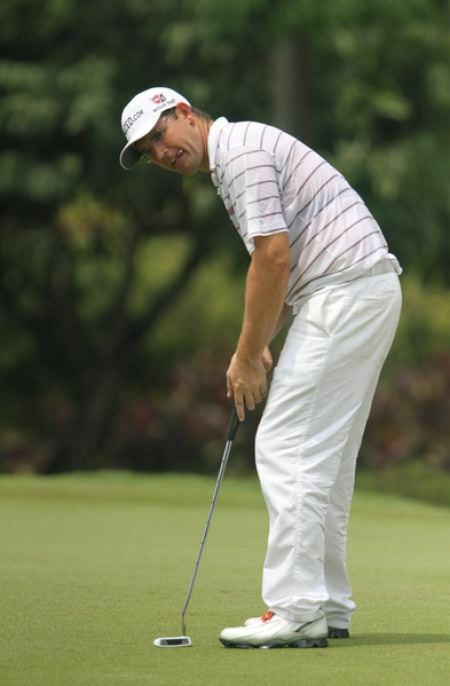 “For me, practicing off the tightest lies is the key. The problem with the chip shots there is you have to make good contact to get the right amount of spin – not overspin it or not underspin it. “For example, you’re right on 11 and you decide to pitch it on the green, if you’ve got confidence and hit it in there with the right strike, you’ve no problem getting it to stop. Mis-hit it, however, and you’re going to put it in the water. While he’s in the last year of his five0year Masters exemption for winning the 2008 US PGA, Harrington prefers to think positively. “Well, I’d like to win. That’d give me a lifetime exemption into the Masters,” he said. 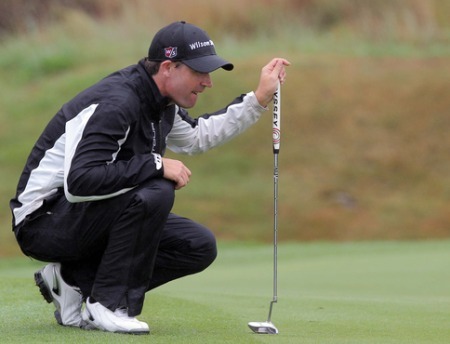 Harrington has yet to have a really good chance of winning but if he never wins, he might not be disappointed.